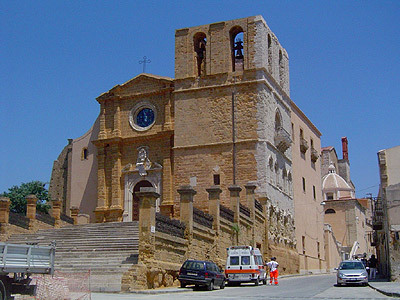 Until 1927, the City was called Girgenti: rising up a short distance from the Mediterranean, on a plain 326m in height, surrounded by two rivers (San Biagio and Drago), which to the South of Agrigento, flow into the Akragas. The main habitation is constructed inside the l’acropoli (acropolis) of the old city, with the Byzantium style Cathedral, the beautiful Church of Santo Spirito (dating back to the 13th Century), the rich Museo archelogico ( archaeological museum) , amongst which, you can find a well preserved and valuable marble ephebe from the 5th century, an admirable piece of local craftsmanship. It is the native land of Empedocle, Filino and of Luigi Pirandello. Founded by the Dori of Gela in 582BC, in a territory already inhabited by break away factions from Siculi, Agrigento (from the Latin Agrigentum, once upon a time also derived from the Greek Akràgas) acquired great importance and wealth through the tyrant Terone, collaborating with Siracusa to contest the Carthaginian predomination of the island (an episode during the battle of Imera in 480). Over the following years, it was involved in a long serious of eventful occurrences: first under the influence of Siracusa, then in 405, it was destroyed by the Carthaginians, conquered twice by the Romans, during the Guerre Puniche (Punic Wars), when in an attempt to preserve its independence, it asked for the support of the Carthaginians. Under Roman dominion, it had from the beginning it was treated under the rules of the Civitas Decumana, following which, it was able to acquire citizenship (43BC), still conserving however, a notable economic importance throughout the Empire. There was a slow decline under the Byzantines, and then without much effort, it was conquered by the Arabs in 827; but the Arabs destroyed it and rebuilt it higher up as a fortress. It flourished not long after and then underwent long sieges and pillaging by Ruggero d’Altavilla, who managed to occupy the City in 1086 and reinstalling the Episcopal diocese, already existent from the 6th Century but suppressed by the Arabs. For the whole of the 13th Century, the old name of Agrigento was transformed into the Arabian one of Girgenti, sustained by Arabian raids: amongst the first Sicilian cities to be sustained by Palermo during the time of the Vespri Siciliani, during the 14th Century it suffered a feud by the Chiaramonte, from which it was liberated in 1392 and returned to the a free Council. The City therefore followed the destiny of Sicily under the Spanish and Bourbonist administration during which it suffered a terrible famine in 1648, but then in 1763, saw the completion of work for the port (Porto Empedocle); from then on it had a discreet economic rise: on 15th May 1860, under the proclamation of Garibaldi it was saved by joining the rebellious factions. During the Second World War, it was subjected to various bombardments and was then occupied by the Alliance on 16th July 1943. Agrigento’s fascination derives above all from the magnificent ruins of the Doric Temples from the Greek colonies, situated in the celebrated Valley of the Temples, which opens up from the foot of the City, towards the sea. The colossal temple dedicated to Zeus Olimpio, which remains unfinished, had, as the ruins show, enormous dimensions (117 metres in length by 54 metres in width) and was adorned with columns which were inserted in a full wall, scattered with giants or telamoni (male statues functioning as columns, equivalent to the feminine caryatids), serving as a support to the trabeation: its interior was shaped liked a cathedral with three distinct naves. Apart from the Temple of the Concordia, one of the best preserved in Sicily, there is also the notable Giunone or Era Lacinia, which still has almost all its columns, and the temples of Vulcano (Vulcan) and Ercole (Hercules), the last being of grandiose proportions. In the temple of Dioscuri, there has only been one corner reconstructed containing a lot pictorial art, which has become the symbol of the City. The Rocky Sanctury of Demetra and Persefone is also of notable interest. Recent digs around the old monastery of San Nicola have brought to light the remains of the Ellenistic-Roman quarters. There is also the Oratorio of Falaride dating back instead to the Roman era. In 1967 the National Archaeological Museum was established in the centre of the Valley of the Temples.